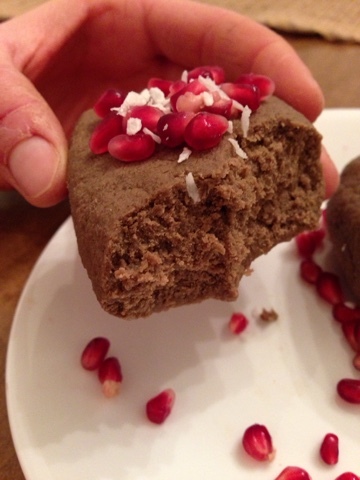 Overnight Chocolate Protein Fudge Bars. 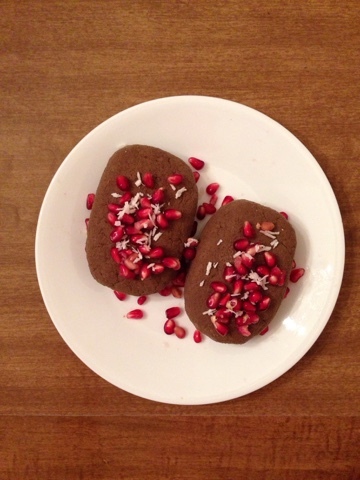 Yep, it's the recipe I teased you all with yesterday morning via Instagram...behold: the best thing you will ever eat. Enjoy! 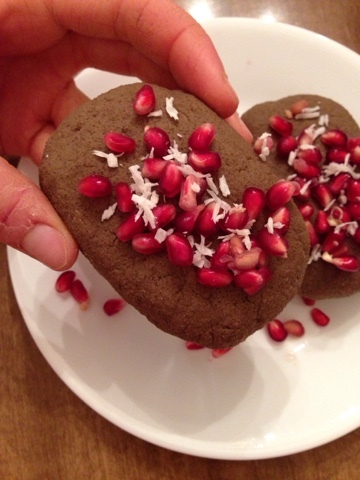 I topped mine with pomegranates and coconut! Delish! Overnight Chocolate Protein Fudge Bars. Vegan, gluten-free. Serves one. 1. Mix protein powder and agar I'm a medium bowl. Add water and mix well until a dough forms. 2. Form two "bars" and place on a plate. Cover with foil and refrigerate overnight. Top as desired in the morning and enjoy! Ok don't ask WHAT made me think of this...but be glad I did...and that I'm sharing the recipe NOW instead of saving it for my cookbook! Enjoy friends. For reals though. This is bomb. 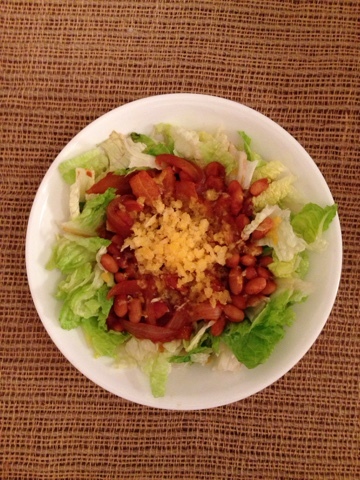 BBQ Beans and Tangerines. Vegan, Gluten-free. Serves one. 1. First, halve your tangerine and section it. Place about 4 slices in a plastic baggy and stick in the freezer overnight (or for at least 8 hours). 2. Place onions in a small saucepan with a little water. Caramelize until soft. Add beans and stir (water should be prett much gone). Toss in your fresh tangerine chunks and add BBQ sauce. Stir well and cook, stirring regularly, over medium heat until gooey and luscious smelling. 3. 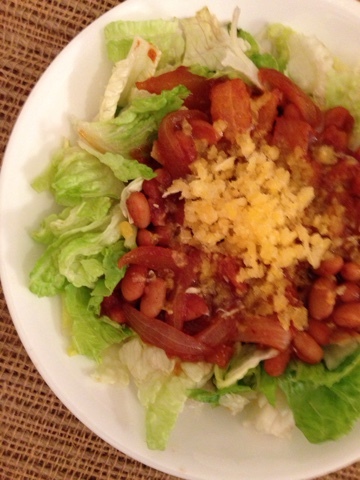 Spoon beans mixture over your lettuce (use spinach for extra iron!). Take your frozen tang slices out of the freezer and, using a hand grater, grate over dish to make "frozen citrus zest"...aka the secret ingredient of why this recipe is seriously insane. Serve immediately. PB Coconut Lentil Stew over Sprouts. This. Oh heavens. Prepare yourselves, friends. PB Coconut Lentil Stew over Sprouts. Vegan, gluten-free. Served one. 1. Combine all ingredients except coconut flour in a medium size soup pot. 2. Stir over medium heat. 3. When lightly boiling, add coconut flour and stir constantly till thick. Serve over sprouts. 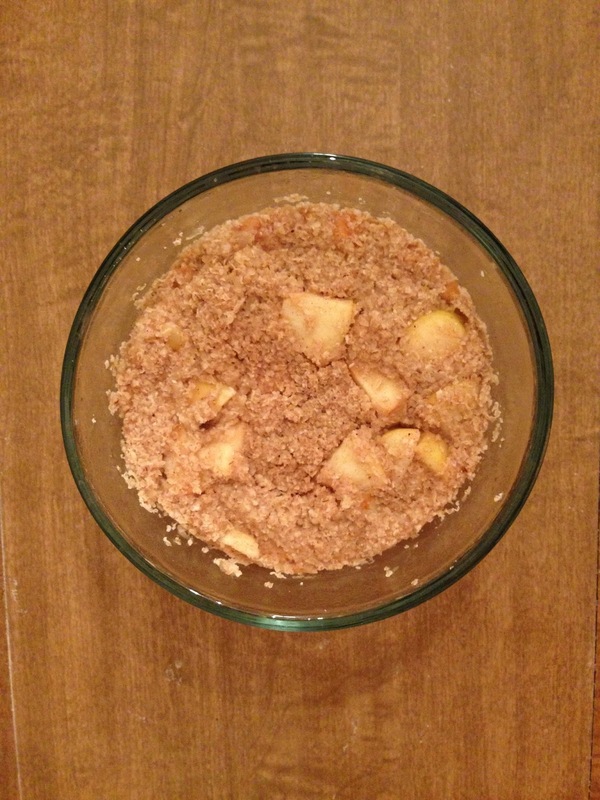 Almost Instant Apple Pie Oatmeal Casserole. Almost Instant Apple Pie Oatmeal Casserole. Vegan, Gluten-free. Serves one. Mix dry ingredients in a medium size bowl. Add almond milk, apple, and applesauce and mix well. Microwave on high for 3 minutes. Let cool and enjoy! September is a weird month, food wise...for me at least. I'm always ready to dive in to fall foods (this winter squash, pumpkin, dark leafy greens, etc...), but summer produce is still in season! It's quite the dilemma, honestly. And then I thought "why not MIX THE TWO?! SUMMERY HARVESTY GOODNESS!" And that, my friends, is how this luscious mess was created. Behold...the Harvest Stuffed Peach. Enjoy! 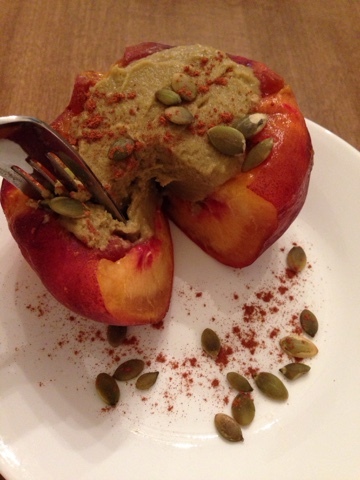 Harvest Protein Stuffed Peach. Vegan, gluten-free. Serves one. 1. Slices around top of peach and scoop out inside and pit using a spoon. 2. 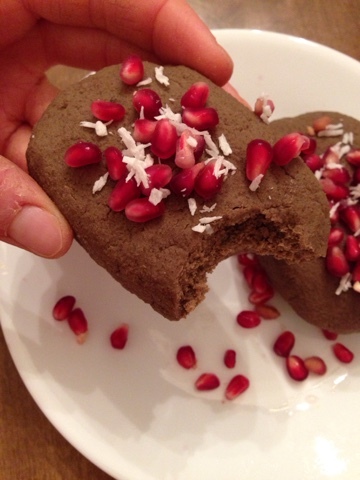 Place protein powder in a small bowl and mix with water until a "frosting" forms. Spoon into hollowed out peach. 3. 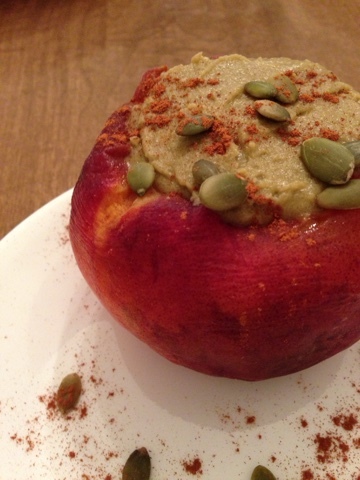 Top peach with pumpkin seeds and sprinkle with cinnamon. DONE! Easy peasy! Fennel and apple are two flavors that were MEANT to be together...and when served over spiralized zucchini fettucine noodles (aka "Zoodlecini!") and tossed in a tangy basil cream sauce...well, enough said, right?! Enjoy! Apple Fennel "Zoodlecini". Vegan, Gluten-free. Serves one. 1. 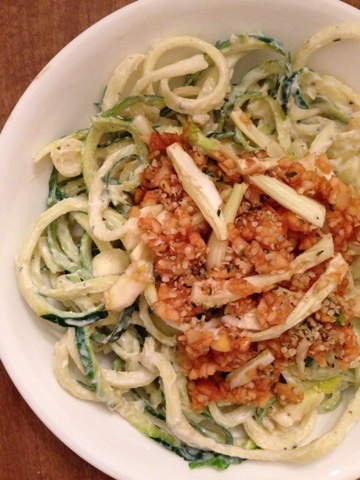 Spiralize your zucchini into fettucine noodles and place in a large bowl. 2. In your food processor, combine tofu, vinegar, water, and spices and blend until smooth. 3. 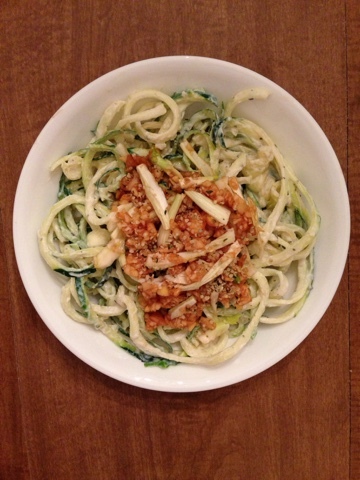 Add cream to zucchini noods and mix well. Serve in large dish. 3. 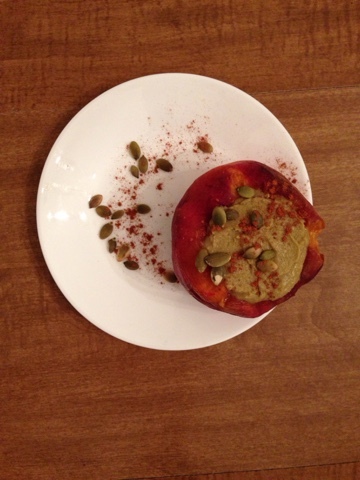 Shred your Apple (I used my food processor!) and mix with sliced fennel and aminos. Serve over noodles and top with hemp seeds. No into to this one because it's so good YOU NEED TO GO MAKE IT THIS INSTANT. Convincing enough?! Enjoy, guys. 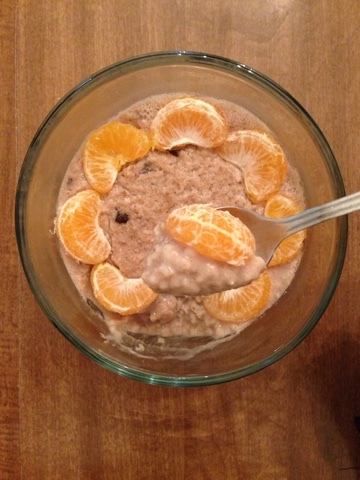 Tangerine Spice Oatmeal. Vegan, Gluten-free. Serves one. 1. 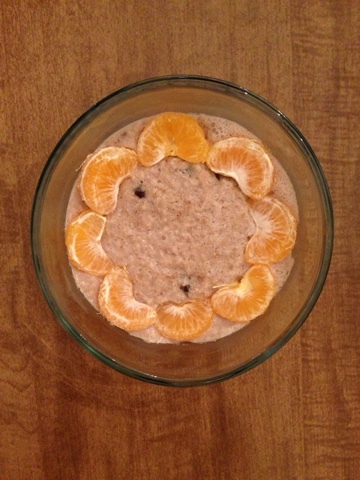 In a large microwave safe bowl, mix oats, allspice, and stevia. Add plant based milk and raisins and stir well. 2. 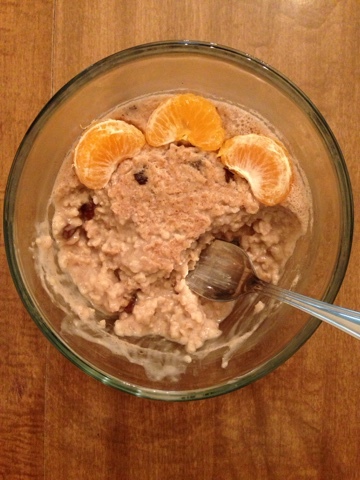 Microwave for 1:30-2 minutes, depending on the consistency you want for your oats (I wanted mine a little soupier, so I added a little more almond milk and opted for a little less time in the micro.). 3. Stir and let sit approximately 5 minutes, for top to harden slightly. Place tangerine slices around edges of bowl and serve. Butternut Squash Breakfast Bowl (aka Fall in a Bowl!). So the arrival of cooler mornings has me craving cooler weather foods...or, in terms others can understand...PUMPKIN (duh...), root veggies, and, the star of this DELISH brekkie recipe: butternut squash. This simple creation started out as a "I really need to use that butternut squash in the fridge, so I'm gonna make breakfast out of it," thing...and quickly turned into a new fall breakfast fave. Hope you guys enjoy it too! 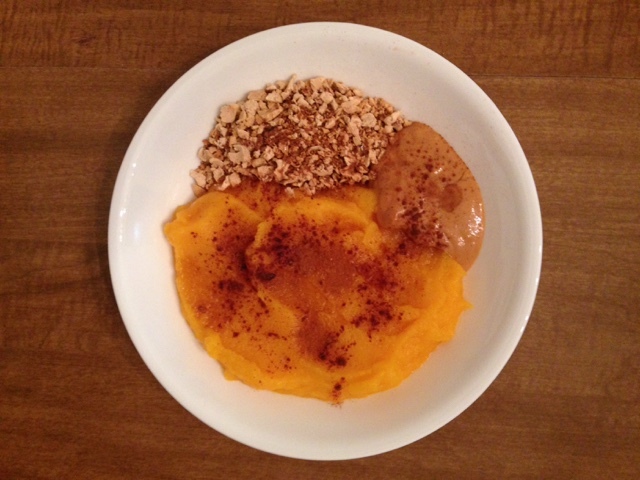 Butternut Squash Breakfast Bowl. Vegan, Gluten-free. Serves one. 1. Steam or boil squash until very tender. 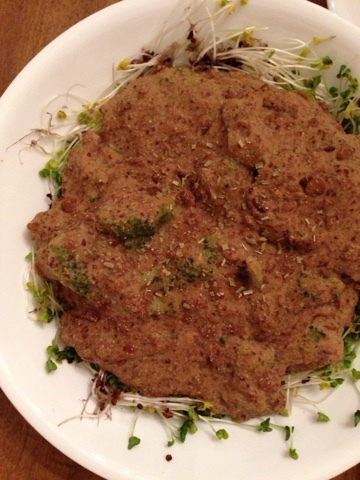 Drain, and whip in food processor with stevia. 2. Toast tvp in a skillet over medium heat, after mixing it with stevia packet and cinnamon. Cook, stirring regularly, until toasted. 3. 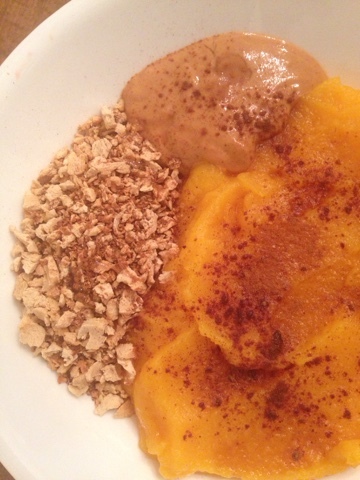 Spoon squash purée onto large plate and add "granola" and peanut butter on the side. Drizzle maple syrup on top and sprinkle with cinnamon. Serve!